So without divulging personal info, who is AnxietyAttack2013? AA: I’m just some guy honestly lol the person you guys see is pretty much who I am irl. Just a bit more outgoing on here. But I’m the same guy you see on here. Just a fun loving guy who love helping others in any way I can. Were you a smoker before getting into vaping? AA: Oh for sure. Couple pack a day American spirits/lucky strikes depending on what I could find. Also really enjoyed a pipe too. Still kinda miss that honestly. The occasional cigar. And I def enjoyed a nice bowl on my hookah. I was def a pretty heavy smoker. How did you discover vaping? AA: My uncle tried one out back in 2009. I didn’t think much at the time but I picked up a 510 autodraw/carto setup to try and quit or at least to cut down around 2010. 2010 was very early in vaping. Did you stick with the carto setups for a while and did you have success quitting with them? AA: I stuck with cartos for a while. I didn’t have any real success though. I tried, but I couldn’t. I’d still smoke, though I cut down to a pack a day and maybe a bowl in the hookah every so often. So real progress, but not enough you know? It wasn’t until like 2012 I think that I finally ended up quitting. But I had moved past that set up by then. What was the set up that finally got you to quit? AA: It was the innokin SVD/protank 2 I think. Or possibly a cartotank. But definitely the SVD. Very nice. The Protank 2 and Mini Portanks were my go to for quitting as well. What has been your setup of choice lately? I have my Naboo right by side currently. It is something special. Your profile lists you as the Patron Saint of MTL. Have you always preferred MTL? or was it something you moved back to? AA: Haha it’s surprisingly a great device! But no, I did jump on the cloud chasing scene for a while around 2013/14ish. My go to set up for a long time was the hexohm v2 and a dark horse RDA or a Kennedy. The OG Kennedy too lol. But I did sorta enjoy that. Still do on occasion. But I missed the flavor. I missed the throat hit. And the tight draw just worked for me. Plus I was going through like 30ml a day when cloud chasing and I couldn’t afford to keep on doing that. Even when I was working at a B&M and got a bit of a discount. This was when the average 30ml was $20 so it was getting expensive, you know? Understandable. 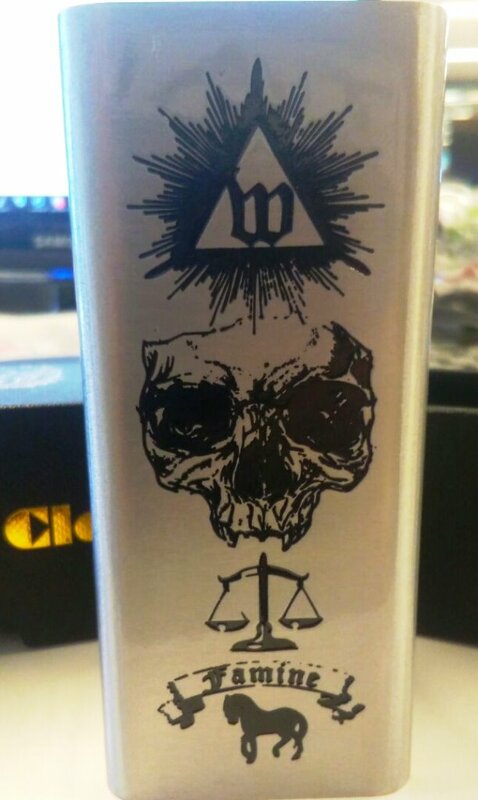 Even with the more common $20/120ml it's hard to find good cheap juice. I feel like MTL,, outside of pod systems, isn't a common aspect of vaping. What is missing from the MTL side that you'd like to see brought to market? AA: You know, recently things have gotten better with MTL. Inexpensive and good MTL rebuildables have become a viable option and have overtaken clones which I think is great. But what I’d love to see is more mid-range priced MTL rebuildables in the $50-$70 range. Everything is $25 or $150 still. There’s no midrange really. Interesting. I have little experience with the MTL side unfortunately but I hope it can become more accepted and common like how squonking has recently. So how did In the Queue come about? AA: Honestly it originally started as a “meet the mods” kinda thing. I thought it would be cool to get to know the mods. The people behind the usernames. And I had gotten a schedule made and I had been hinting at it for a while and even had one or two interviews conducted. And that was right before the…fiasco shall we say…happened. And I decided it might be a good idea to scrap the idea. At least for the time. There was too much going on and it really would have just been stirring the pot, you know? Sadly, there has been many, and I'm not sure which fiasco you're referring to. But we won't get into any of that. Outside of what you've already mentioned, have there been any interesting challenges you've come across doing ITQ? Well that's good to hear that it has been pretty smooth. It seems to be well liked by the community as well. Any future plans for ITQ? Ambitious but I dig it. I hope it works out! What are your hobbies outside of vaping (if you consider vaping a hobby)? AA: I love writing so probably that. I’m currently working on a couple books. Ones sorta a modern fantasy that deals with imperialism, colonialism, environmentalism, and animal rights. I know lol, sounds pretty boring but eh, hopefully it’ll be done eventually. Also writing music. Been working on this album for a while. Sort of a folk/emo (like 90s emo) sound. Aside from that, I occasionally like to build models. Mainly gundam models lol. I’m kinda low key a total nerd. Quick shout out to /r/gunpla which is a pretty rad community. Wow. Those are unique and intriguing hobbies. Music and writing is something to be proud of. Restoring pens is legit cool. Gundam and knitting are just a awesome. Very nice. You should be proud of all of that. AA: Lol thanks my dude! I think that's all I have. Any closing words for ECR? I think that's always the hardest question you ask. AA: Haha you’re not wrong on that. I guess first, thank you guys so much for helping make what I do what they are! For reading all of the stuff I’ve done, and for hopefully enjoying it! And a huge thank you for helping spread #teampositivity ❤ continue being your rad selves! We’re all in this together, ya know? Hopefully we can all continue to spread the love and positivity and do what we can to help one another! Well said. You're quite welcome. It was an honor of sorts to be asked to do one and it only felt fitting to return the honor. So that’s it. /u/AnxietyAttack2013: MTL Vaper, Reviewer, DIYer, Interviewer, Master of unique hobbies, champion of #teampositivity, and probably not a serial killer 😉 I hope you all enjoyed reading and learning a bit about the person behind In the Queue for a change. Hey Hey ECR!Today I bring you an exciting one episode only segment of Behind the Queue. The man behind In the Queue, /u/AnxietyAttack2013, asked me awhile back to do an episode of In the Queue. It was humbling to even be asked and as I was answering questions I realized maybe people want to know who AnxietyAttack2013 is? He’s asking us all these questions but what do we know about him? Why not do him the same honor? So without further Apu…Note – These responses are direct copy and paste from our conversation. Only minor changes to spelling may have been madeSo without divulging personal info, who is AnxietyAttack2013?AA: I’m just some guy honestly lol the person you guys see is pretty much who I am irl. Just a bit more outgoing on here. But I’m the same guy you see on here. Just a fun loving guy who love helping others in any way I can.I’m the guy who will probably say hi to your dog first and then say hi to you lolWere you a smoker before getting into vaping?AA: Oh for sure. Couple pack a day American spirits/lucky strikes depending on what I could find. Also really enjoyed a pipe too. Still kinda miss that honestly. The occasional cigar. And I def enjoyed a nice bowl on my hookah. I was def a pretty heavy smoker.How did you discover vaping?AA: My uncle tried one out back in 2009. I didn’t think much at the time but I picked up a 510 autodraw/carto setup to try and quit or at least to cut down around 2010.He didn’t end up quitting but he did introduce me to ecigs at least2010 was very early in vaping. Did you stick with the carto setups for a while and did you have success quitting with them?AA: I stuck with cartos for a while. I didn’t have any real success though. I tried, but I couldn’t. I’d still smoke, though I cut down to a pack a day and maybe a bowl in the hookah every so often. So real progress, but not enough you know? It wasn’t until like 2012 I think that I finally ended up quitting. But I had moved past that set up by then.What was the set up that finally got you to quit?AA: It was the innokin SVD/protank 2 I think. Or possibly a cartotank. But definitely the SVD.Very nice. The Protank 2 and Mini Portanks were my go to for quitting as well. What has been your setup of choice lately?AA: Most recently it’s been whatever I’ve been reviewing honestly. So it kinda changes every day haha. But when it’s my choice it rotates between the cartel revenant 160/siren 2, Hcigar VT inbox/Ammit MTL RDA, and the Smoant Naboo/Hastur mini MTL RTAI have my Naboo right by side currently. It is something special. Your profile lists you as the Patron Saint of MTL. Have you always preferred MTL? or was it something you moved back to?AA: Haha it’s surprisingly a great device!But no, I did jump on the cloud chasing scene for a while around 2013/14ish. My go to set up for a long time was the hexohm v2 and a dark horse RDA or a Kennedy. The OG Kennedy too lol. But I did sorta enjoy that. Still do on occasion. But I missed the flavor. I missed the throat hit. And the tight draw just worked for me. Plus I was going through like 30ml a day when cloud chasing and I couldn’t afford to keep on doing that. Even when I was working at a B&M and got a bit of a discount. This was when the average 30ml was $20 so it was getting expensive, you know?Understandable. Even with the more common $20/120ml it’s hard to find good cheap juice.AA: Haha that’s what lead me to DIYing again actuallyI feel like MTL,, outside of pod systems, isn’t a common aspect of vaping. What is missing from the MTL side that you’d like to see brought to market?AA: You know, recently things have gotten better with MTL. Inexpensive and good MTL rebuildables have become a viable option and have overtaken clones which I think is great. But what I’d love to see is more mid-range priced MTL rebuildables in the $50-$70 range. Everything is $25 or $150 still. There’s no midrange really.Interesting. I have little experience with the MTL side unfortunately but I hope it can become more accepted and common like how squonking has recently. So how did In the Queue come about?AA: Honestly it originally started as a “meet the mods” kinda thing. I thought it would be cool to get to know the mods. The people behind the usernames. And I had gotten a schedule made and I had been hinting at it for a while and even had one or two interviews conducted.And that was right before the…fiasco shall we say…happened. And I decided it might be a good idea to scrap the idea. At least for the time. There was too much going on and it really would have just been stirring the pot, you know?Thankfully I had another idea about the reviewers and started with Anthony vapes. But it kind of evolved from that. It was originally going to be just reviewers but I quickly decided to have it be any prominent or interesting members of the community lolMy timing wasn’t exactly the best with the meet a mod idea lmaoSadly, there has been many, and I’m not sure which fiasco you’re referring to. But we won’t get into any of that. Outside of what you’ve already mentioned, have there been any interesting challenges you’ve come across doing ITQ?AA: Lmao it’s actually gone pretty smoothly for the most part. A few times I miscalculated time zone differences and was off by an hour but otherwise it’s been pretty straightforward and smooth sailing. Once or twice I had tried to set something up that’s unfortunately fallen through but things have been pretty easy going with it lolWell that’s good to hear that it has been pretty smooth. It seems to be well liked by the community as well. Any future plans for ITQ?AA: Im looking to try expanding it to some well known people outside of reddit. I’d love to try and get like Phil Busardo or GrimmGreen on for an episode. And get more people that are involved with advocacy work too. I haven’t committed yet fully to those ideas yet but they’re in the works hahaAmbitious but I dig it. I hope it works out!AA: Thanks :)What are your hobbies outside of vaping (if you consider vaping a hobby)?AA: I love writing so probably that. I’m currently working on a couple books. Ones sorta a modern fantasy that deals with imperialism, colonialism, environmentalism, and animal rights. I know lol, sounds pretty boring but eh, hopefully it’ll be done eventually. Also writing music. Been working on this album for a while. Sort of a folk/emo (like 90s emo) sound.Aside from that, I occasionally like to build models. Mainly gundam models lol. I’m kinda low key a total nerd. Quick shout out to /r/gunpla which is a pretty rad community.Oh, and I collect fountain pens and restore vintage fountain pens. It sounds boring but eh, I like it ya know? Goes hand in hand with the writing I guess. My vintage Parker 51 and my vintage eversharp gold seal are two of my favorite that I own lolOh, and I absolutely love knitting tooWow. Those are unique and intriguing hobbies. Music and writing is something to be proud of. Restoring pens is legit cool. Gundam and knitting are just a awesome. Very nice. You should be proud of all of that.AA: Lol thanks my dude!I think that’s all I have. Any closing words for ECR? I think that’s always the hardest question you ask.AA: Haha you’re not wrong on that. I guess first, thank you guys so much for helping make what I do what they are! For reading all of the stuff I’ve done, and for hopefully enjoying it! And a huge thank you for helping spread #teampositivity ❤ continue being your rad selves! We’re all in this together, ya know? Hopefully we can all continue to spread the love and positivity and do what we can to help one another!And thank you sc0lm00 for doing this! It’s been a nice change of pace to be on the other side hahaWell said. You're quite welcome. It was an honor of sorts to be asked to do one and it only felt fitting to return the honor.AA: Haha it was an honor to be asked to do this with you too :)So that’s it. /u/AnxietyAttack2013: MTL Vaper, Reviewer, DIYer, Interviewer, Master of unique hobbies, champion of #teampositivity, and probably not a serial killer 😉 I hope you all enjoyed reading and learning a bit about the person behind In the Queue for a change.Keep being awesome.